Journey of Discovery Jumper is rated 4.7 out of 5 by 32. Put the whole world in perspective with this activity jumper. Each of the 12 activities takes your baby on a global expedition. Play with the North Pole’s friendly snowman and ice cube bead chaser, or discover the deep seas with Baby Neptune and his submarine. See more of the world with every spin of the multi-color globe, which plays internationally-inspired music and introduces instrument sounds and phrases in three languages. Your baby will love exploring every tactile sensation of the multi-sensory postcards – a soft souvenir from his adventure “travel.” This Baby Einstein standing jumper is made for growing babies, so the four height positions are easy to adjust. Its bouncy seat rotates 360 degrees, while supporting baby with a comfy, machine washable seat pad and high seat back. 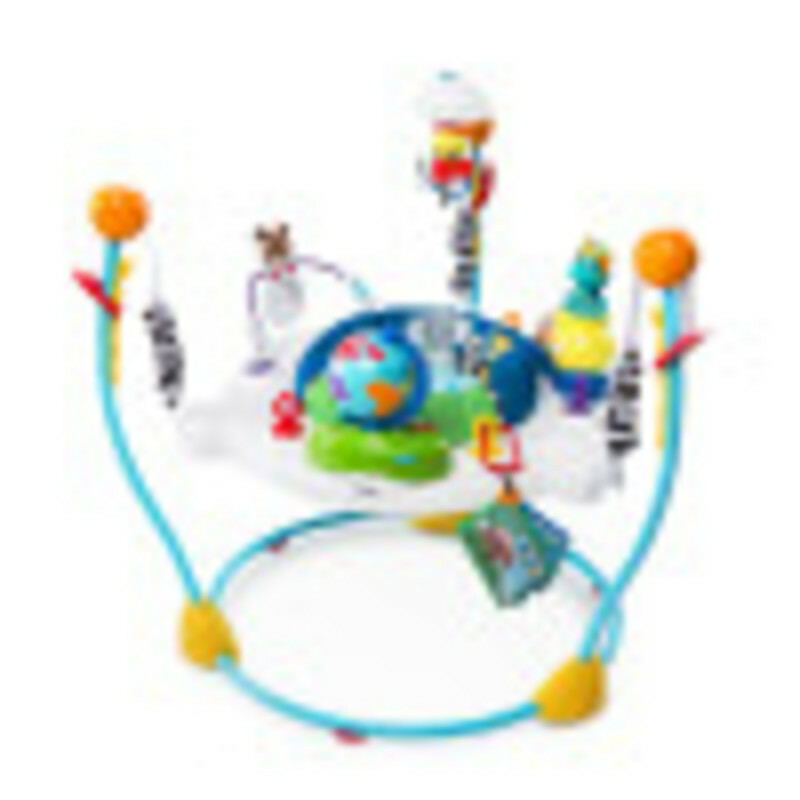 It's easy to move this activity center from room to room as your baby jets off on his Journey of Discovery. Dimension (in) 32" x 32" x 33.13"
Fabric Seat – Machine wash the fabric seat in cold water. Use a gentle wash cycle with no bleach. Tumble dry, using low heat.Plastic Parts – Wipe clean with damp cloth and mild soap. Air dry. Do not immerse in water. Rated 3 out of 5 by Crystal moore from Good product Baby really loves it unfortunately the straps are uneven which makes him lean forward or back. Not sure why it's that way. Rated 5 out of 5 by Clsehm224 from So fun & interactive! This jumper is a LIFE SAVER! My daughter can sit in it for a solid 30 minutes & entertain herself (9 months old) so I can get things done. Usually I can’t put her down, but she loved this jumper. So much catches her eye visually, so it’s always exciting for her. My older children are jealous they can’t fit in it, so it’s definitely a hit in our house! *I received this product to review at no cost but all opinions are my own. Rated 5 out of 5 by Clsehm224 from So fun & interactive! This jumper is a LIFE SAVER! My daughter can sit in it for a solid 30 minutes & entertain herself (9 months old) so I can get things done. Usually I can't put her down, but she loved this jumper. So much catches her eye visually, so it's always exciting for her. My older children are jealous they can't fit in it, so it's definitely a hit in our house! *I received this product to review at no cost but all opinions are my own. Rated 5 out of 5 by queenbmarie from Fabulous style The look of this Baby Einstein Journey of discovery jumper is just the best I have saw in a jumper so far! My Little has went threw two and had nothing to do with them but this one she loved it! It has great little things to keep them busy while mom and dad are able to get some house work done. I would actually have to get her out of it she never cried to get out herself she would truly try to get in it herself. Just precious. Great job on this! Rated 4 out of 5 by Kellyhitt13 from Mommy’s break! This jumper is a life saver!!! My LO Love to sit and is now starting to jump in it. The jumper was extremely easy to assemble and it’s suoer easy to move from room to room. Currently, it stays in the middle of my living room floor facing the TV. I put on a baby Einstein video and fold laundry, pick up the house, etc. The only reason I gave it 4 starts instead of 5 is because I feel like their should be extra toys to attach to the red, yellow, purple, and orange circle plugs. I have to go to another toy and unhook the “dangling toys” that were included with that toy and attach them to the jumper. Other than that, I love the jumper. Rated 4 out of 5 by Kellyhitt13 from Mommy's break! This jumper is a life saver!!! My LO Love to sit and is now starting to jump in it. The jumper was extremely easy to assemble and it's suoer easy to move from room to room. Currently, it stays in the middle of my living room floor facing the TV. I put on a baby Einstein video and fold laundry, pick up the house, etc. The only reason I gave it 4 starts instead of 5 is because I feel like their should be extra toys to attach to the red, yellow, purple, and orange circle plugs. I have to go to another toy and unhook the "dangling toys" that were included with that toy and attach them to the jumper. Other than that, I love the jumper. Rated 5 out of 5 by cmk505 from Perfect jumper for baby This jumper is by far my favorite on the market! The toys are cute and engaging for the baby so between those and the ability to jump, she's entertained for a good 30 minutes! We really like how easy it is to change the height of the seat, much easier than the previous jumper we owned. Love the little hooks for additional toys and books to be attached. Highly recommend!